Subject: CONGRATULATION YOU ARE A LUCKY WINNER!!! Euromilliones Loteria Espa�ol Award 2008. N�19, 28014 Madrid,Spain Branch Office. GAMBLING BOARD OF SPANISH LICENSED. ONLINE BALLOT LOTTERY (Registration 70339411). balloting sweepstake Lottery held on 11th of April 2008.
therefore you do not need to buy ticket to enter for it. date will be considered as unclaimed accordingly. � Copyright 1994-2008 The Euromilliones National Lottery Inc. This Email with the Subject "CONGRATULATION YOU ARE A LUCKY WINNER!!!" was received in one of Scamdex's honeypot email accounts on Tue, 15 Apr 2008 05:29:27 -0700 and has been classified as a Generic Scam Email. 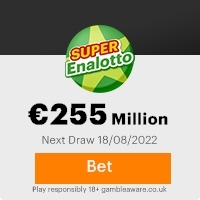 The sender shows as Euromilliones National Lottery <lotterynotify@yahoo.es>, although that address was probably spoofed. We recommend that you do not attempt to contact any persons or organizations referenced in this email, as you may expose yourself to scammers and, at the very least, you will be added to their email address lists for spam purposes.